Update: Blizzard says "The leader of Wintergrasp raids can no longer kick players from the raid (this change will also apply to Tol Barad in Cataclysm)." So we have about a week left from the experiment! Go for it. At first, our tenacity is mostly gone. When we started visiting wintergrasp, we often had 5-10 tenacity. If 15 people shown up, that was a good day. Now we barely have tenacity, strike that, often the horde has 1-2. The player count increased to 25-30. On Sunday, on the first time since I'm on Agamaggan, the first raid was full with 40 people! The second thing needs a little explanation. Many commenters said that WGClean could backfire as the "poor discriminated people" (the kicked M&S) fight back. Well, they didn't (if they could fight they wouldn't be M&S at the first place), but someone utilized the kick ability. Meet Wártrain, who looks just another gemless-enchantless, green geared moron. But he is much more than that: he is the alt of the properly geared Wartrain, a horde character. So the ally guy sometimes come to WG to disrupt the alliance. Of course he quickly got to the clean list, but as a horde saboteur instead of random lolkid, he did not give up. And on Saturday, luck shined upon this busy blood elf disguised as a draenei: he got lead and started to kick people, focusing of course to those who are frequent in WG. What could I do? Wrote to the /general that "The random raid was captured by a horde saboteur, leave that raid and whisper me for inv". I hoped that a few guys plus the guildies join, so at least we can set up a south defense. And it was like this for a couple more pages. And we won, despite the time lost to reforming! So the other people from the server are coming to WG now and they were ready to leave the random raid, joining mine. WGClean, or more accurately the idea behind it: "kick the M&S and we all benefit" works and the people here agree. I don't think they are bloodthirsty anti-socials who like griefing. They are just ordinary people who want to win (like everyone except the "i play 4 fun lol" filth) and they have given up hope due to the constant sabotage of the M&S. Now that someone stood up against the leeches, they joined up! Getting rid of the M&S is not griefing or elitism. It's something that benefits all useful people. If you are like the allies on Agamaggan, withdrawn from things that was once fun and minimize your activity because the M&S poisoned everything: either start the same in your server, or transfer/reroll here to EU-Agamaggan (too bad that the second option is EU-only). Just read the rules before you do! 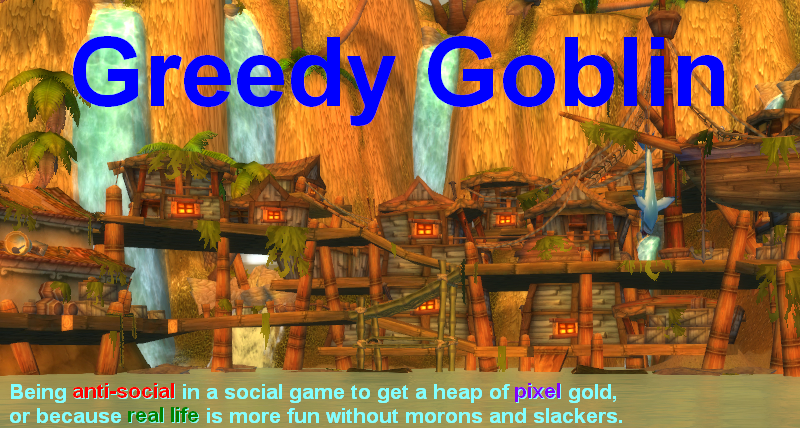 Experience first hand how is it to play without having to carry lolling filth everywhere! And what about the third new thing? For the first time since WotLK started, the horde on Agamaggan-EU had instant promotion, so we pushed the hidden scale to the maximum by constant winnings. By the way the instant promotion was not enough for them to win. They could only win 2 battles later, when they had instant promotion and outnumbering force. Looks like a few people are communicating and/or leading. Actually, it just suggests that larger numbers = higher win ratio in WG, holding all else equal. "WGClean, or more accurately the idea behind it: "kick the M&S and we all benefit" works and the people here agree. I don't think they are bloodthirsty anti-socials who like griefing. They are just ordinary people who want to win (like everyone except the "i play 4 fun lol" filth) and they have given up hope due to the constant sabotage of the M&S." How do you come to that conclusion, based on people leaving a Horde saboteur and joining your raid? That has nothing to do with M&S sabotage. The fact that more people are in WG is due to the higher win rate you are getting generally. The more wins you can string together, the more likely people on your server will want to leech and jump on your bandwagon for free marks and VoA. Likewise, the less Horde will join WG because they don't want to waste time on losses. As a result, your Alliance plebs can mindlessly zerg the Horde and still win if they wanted. By the way, I don't think the Horde had instant promotions with that sort of win rate. I do find it unlikely that with 33 successful Alliance defences vs 65 successful Horde defenses, that there was a point where Alliance successfully defended 13 times in a row to allow the Horde to get instant promotions. What was much more likely is that a number of Horde ambushed one of your Alliance parties and obtained all their kills in a single zerged attack. Very nice to hear. What exactly changed over the last week or so though that tenacity has pretty much disappeared? I mean why exactly are more Alliance turning up now? @Squishalot: you now blame some kind of magic spiral "they come because we win and we win because they come", without any explanation how did it start? Do you have any alternative idea than WGClean. Instant promotion does not need 13 wins IN A ROW. Read the linked WoWinsider article about details. In short: if a "defense-loss + attack win" is included between our defense wins it does not disrupt the counter. We reached instant promotion on the weekend, where children population is high. At the horde it caused lot of useless lolkids, at the ally, just lot of kicks. Note: the screenshot shows east side and the horde spawns west. It's completely impossible to ride through the map, kill 15 allies, build a demo and drive it halfway up in 2 minutes. If was a single hordie who flied in to SR, killed an NPC and built a demo. I must say I don´t regret the 45€ for changing the server. Also I think about giving Ðesolate the honor to be my second char hitting 85 and a bit of serious time. WGClean works well from my PoV. It supports and gets a bit pressure to the people who need it to perform well. There are still some issues and less benefit turns, but it comes closer to a premade organized BG-group than anything in the random pvp I´ve seen in three years. "By the way, I don't think the Horde had instant promotions with that sort of win rate." I can personally confirm that. I´ve been in the fight where we lost by instant promotion (sieges after less than one minute after fight) and tendency. "Do you have any alternative idea than WGClean." I told you last week. Your presence in WG, prior to WGClean, has led to more wins. "Read the linked WoWinsider article about details. In short: if a "defense-loss + attack win" is included between our defense wins it does not disrupt the counter." I did, and you should too. I'll rephrase - 13 times in a row isn't quite accurate. 13 successful defences before the Horde achieved a single successful defence. Given the ratio of Horde / Alliance successful defences in the period, it seems questionable. "We reached instant promotion on the weekend, where children population is high. At the horde it caused lot of useless lolkids, at the ally, just lot of kicks." I note that you don't have tenacity in that screenshot. There can't have been that many Horde lolkids. "Note: the screenshot shows east side and the horde spawns west. It's completely impossible to ride through the map, kill 15 allies, build a demo and drive it halfway up in 2 minutes. If was a single hordie who flied in to SR, killed an NPC and built a demo." Are you telling me that you don't zone into WG before the battle starts? When I play WG on assault, I can get access to siege within 2 minutes every single time, provided that our zerg wipes out the Horde zerg. I start off at Westspark, not all the way over at the Alliance camp. We wipe out the Horde on the way through to take BT, then jump in our siege / demos for the assault. All it takes is a few Horde with brains to do the same thing. Think about it. It's very easy to kill a bunch of Alliance lolkids as they zone in around SR. I'll take your word for it you mustered up enough defences in a row to get instant promotion. I'd be curious to see the timing of those wins, in the same way that you produced for the ganking guild. @Squishalot: early zoning in helps in capturing an undefended spot like WP/EP. But you can't wipe a zerg with zoned-in people unless you zone in with a zerg-size premade. Also, I have to accept that nighttime winnings can have serious part in the outcome. The server is low-populated both sides, so if we win the battle around 10 PM, it's pretty likely that the following 3-4 battles will be "won", simply by no one showing up either side to take WG, so it remains ally controlled. Also, since the project is open to everyone I cannot lie in such things as instant promotion as anyone is free to join us just to catch me lying. "Also, I have to accept that nighttime winnings can have serious part in the outcome. The server is low-populated both sides, so if we win the battle around 10 PM, it's pretty likely that the following 3-4 battles will be "won", simply by no one showing up either side to take WG, so it remains ally controlled." That's fair enough. You just don't get a sense of that from the post. You make it sound like WGClean just dominated, when it is in part due to other factors. "early zoning in helps in capturing an undefended spot like WP/EP. But you can't wipe a zerg with zoned-in people unless you zone in with a zerg-size premade." You don't need a premade. You just need enough randoms to zone in early, then spam in /general to get them to group up. And why the hell do morons keep calling it WP? It's West-Spark and East-Spark - WS and ES. Newest Patchnotes: "The leader of Wintergrasp raids can no longer kick players from the raid"
As you said, your way was perfectly legit and if Blizzard didn't intend you to do so, they would change it. You may want to go for the way you already went due to the horde-Leader - Leaving the big raid and invite all your non-M&S players. This should have a similar effect without the kicking, but instead not-inviting. - The leader of Wintergrasp raids can no longer kick players from the raid (this change will also apply to Tol Barad in Cataclysm). @ The patch note posters. It seems unlikely that Gevlon (And others like him) are the cause of this change. However Gevlon includes the most likely cause in today's post, griefers like Wartrain. Well, they've never managed to fix things like class balance or faction ratios, but they're certainly on the ball when it comes to getting the M&S boosted. I hope they impelemnt the BG-AFK voting ability. unless that WG & TB is god-heaven for the brainless and fishermen. How many more people are going to quote the patch notes? To me it shows the success of WGClean - it made a impact big enough to be noticed by Blizzard. Your example with the horde infiltrator shows that maybe it will be possible to make it work in Cata with leaving the raid and forming your own one. Sadly if you can't kick people even from the raids you formed in WG, then it would require disbanding the raid every time a player is added to the black list. "The leader of Wintergrasp raids can no longer kick players from the raid (this change will also apply to Tol Barad in Cataclysm)." The era of WGclean is not necessarily over. If you still can leave and make your own raid, it will just require to do that and maybe add a timer to the addon to warn people via /1 that they are in the wrong raid. That's one huge leap of faith,to which, I don't subscribe. Of course if you have any actual evidence that Blizzard acted on WGClean then please present it. I'd love to believe that Gevlon can have an influence on Blizzard. "It seems unlikely that Gevlon (And others like him) are the cause of this change." The timing of the change tells a different story. Wrath has been live for 2 years and only now griefers have started to abuse the kick mechanic? The new version of WGClean will need to filter invites to ensure that you don't accidentally invite someone from the ban list - as you now can't remove them. Blizzard really does make the game M&S boosting as possible; happy I am no longer playing. Not terribly surprised by the patch news, although there is nothing to indicate my dropping Blizz a line to let them know what Gevlon was up to had anything to do with their decision. I am mildly disappointed that I won't be getting an opportunity to test out my heavily modified version of WGClean in TB - used against an unwary raid leader the results would have been ... amusing. Ah well. It's too bad Blizzard doesn't see the increased participation/interest that comes from removing a small percent of the players as a good thing. People are clearly more interested in WG when the team works together and has a chance to win. Maybe the best way to balance battlegrounds is to provide new tools to remove/punish the M&S. I see a few other posted about the up coming patch. This is clearly not good, as I was looking forward to a 'clean' Tol barad. They have to keep their M&S dollars rolling in so I suppose the rest of us just have to lose out. It's a pity. What you did when the horde player was made leader of WG is how I would envision WGClean working going forward, given the information in the new patch notes. It would be modified to announce in General zone chat that you were there and running a raid group and that players should whisper you with a certain word to receive an automatic invite so long as they are not on the blacklist. Also when the patch notes talk about 'Wintergrasp raids' I would think they are talking about the automatic raid groups that are put together (on my server/faction there are usually 2-3 full random raid groups). I can't imagine that they would prevent a raid leader from kicking people from a raid that was put together by hand, regardless of where on a map those players happen to be located. So in short (I think) if you are the leader of a random blizzard created WG raid you can't kick people, if you leave blizzard's raid and form your own then you can do anything a normal group leader can do. @Cryptic: This is also the kind of system I am currently implementing into WGClean. Oh goddamn it. I JUST wrote a guide to running a Wintergrasp raid that included a section on kicking people. @Treeston Cryptic: it won't really work. The lolkids are no longer kicked, they are in the automatic raid with the other lolkids and the casual people who just queued in. They no longer FEEL rejected so they have absolutely no reason to either improve or leave. By leaving the automatic raid and forming our own, we only achieve to not SEE the lolkids, they are still there and cause equal damage. Game over. Accept it, move forward. Forming a new raid (the "Elite" raid) also has a social effect. People can be accepted to the "cool guys" raid, or rejected. It is not as effective, but it is effective, or at least worth a try. This new change most likely had nothing to do with Gevlon, sorry to burst your collective bubbles. There have been "kick everyone" griefers for as long as WG has existed, and Blizzard is just notoriously slow at fixing things like that. Just a coincidence with the timing. @ Kenny (and any other people who think Gevlon has 'had an effect on Blizzard'): "It seems Gevlon, you have been having quite the effect on blizzard!" In the same way that exploit-users have an effect on Blizzard, Gevlon has had an effect on Blizzard. Blizzard would never have noticed Gevlon if it weren't for the people who complained about their unfair treatment. It should be clear now that it was never 'working as intended', despite the hopes of Gevlon and many blog readers. @ Wilson: "Not terribly surprised by the patch news, although there is nothing to indicate my dropping Blizz a line to let them know what Gevlon was up to had anything to do with their decision." Like Gevlon did, I too raised a GM ticket to ask about the legitimacy of raid leaders kicking people out of the WG raid. Unlike Gevlon though, I added more specific details about which raid RLs are kicking people out of, but also unlike Gevlon, I got a generic "We will be looking into it, thanks for the feedback!" response. No, I don't know if that made a difference. I don't think it would have though. One or two people don't change the world. Thinking that WGClean that 'abused' handful of M&S is a reason for Blizzard to disable random-assembled raid leaders ability to kick is really, really far fetched. The same way I can have a really strong faith that they made this LFD portal room because I often 'abused' LFD to travel faster to places I have no FP yet. I simply queued as tank, entered dungeon, pulled as much as I could, died, spirit ressed and left the group, leaving 4 bewildered M&S behind. 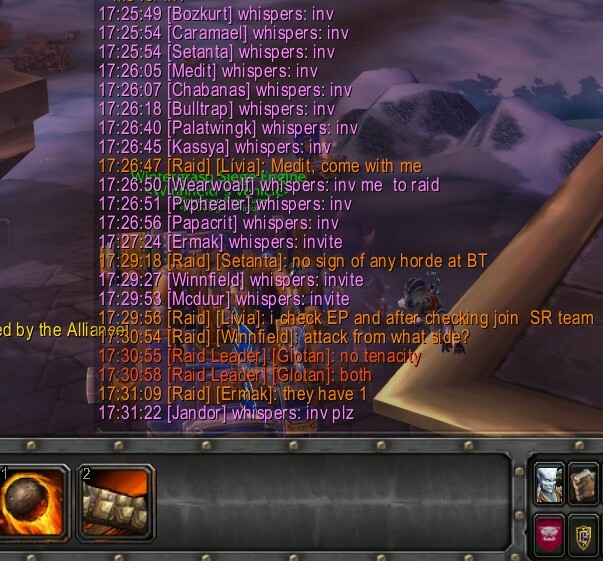 There's a guild on the horde side on my server whose members kick everyone in the random raid not in their guild, if they get a raidleader. They've been doing it solely for "the lolz" for at least half a year now, and I'm sure that they're not the only ones being "funny" that way. That kind of people are the cause for the change, not WGClean. Gevlon, it is now more obvious than ever that without the M&S, Goldman Sachs would not become rich. And GS knows it. So does Blizz. Most of Blizzard's staff are probably busy polishing cataclysm for next month's release. I would be surprised if the change had more to do with WG than some programmer doing the last passes on Tol Barad. Blizzard has historically been very slow and wary of making minor changes and fixes since the game is so heavily modified from its original incarnation that things break unexpectedly. Keep in mind that while 4.0 is a nice preview of the talent and skill changes, this whole period of time also represents an extended troubleshooting session to prepare for the large rush of renewed subscriptions from the expansion.